Audio 88's "Round-Island Pow Wow Escapade"
Our 2nd destination of the day, which was a few blocks away from the first. This setup was in the master bedroom, which is bigger than the James' room. It seems that everyone of the hosts has one of these Audioprisms?! A way of raising your cables off the floor is to use clothes pegs, as seen in the picture. 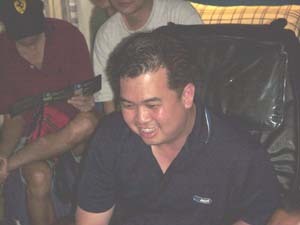 The man himself, "Tua Towkay" Brandon listening to his customer's setup. He is seated on a comfortable XXXX brand massage chair... easily the best "upgrade" to any system! 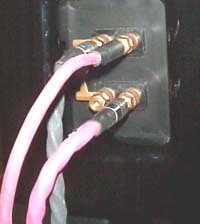 Look how the Live speaker cable is connected. 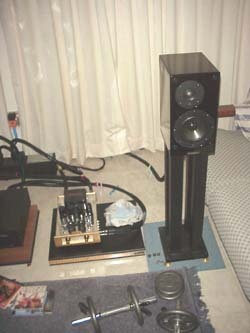 2 positive and 1 negative, with a Cardas jumper bridging the tweeter's negative to the woofer's. 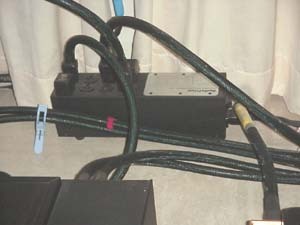 This is part of the design of Live cables. 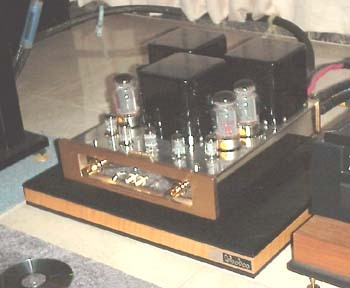 Audio Space power amp on Voodoo board. 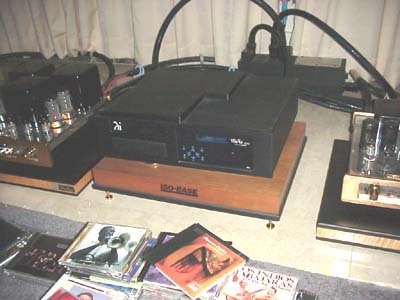 Wadia Digital 830 CD player on Iso-base.